This text provides students with a solid foundation for understanding data analysis and specific statistical techniques. 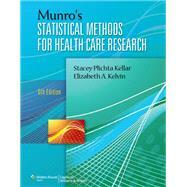 Focusing on the most current and frequently used statistical methods in today's health care literature, the book covers essential material for a variety of program levels including in-depth courses beyond the basic statistics course. Well-organized, clear text discussions and great learning tools help students overcome the complexities and fully comprehend the concepts of this often intimidating area of study.